Back home in Oklahoma the summer is gearing up, and most of our yard birds are already starting on their second clutch. But here at Harvard Forest, the breeding season is just cranking up. You can almost smell the avian testosterone. But, far more emotionally uplifting (and less olfactorily disturbing) is the plethora of bird song that starts around 4:45 in the morning. And of all the bird song, that of the hermit thrush echoing through the greening forest, is the best . 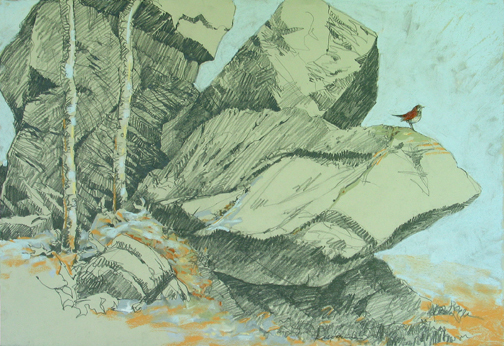 “Hermit on the rocks” by Debby Kaspari, pastel and graphite on paper. This entry was posted on Sunday, May 25th, 2008 at 5:51 pm and is filed under biodiversity. You can follow any responses to this entry through the RSS 2.0 feed. You can leave a response, or trackback from your own site.